The presentation of our new brand and logo signals a new era at DHJJ,” said Tom Jordan, Managing Director at the firm. "We are large enough to specialize but small enough to individualize our relationship with each and every client. 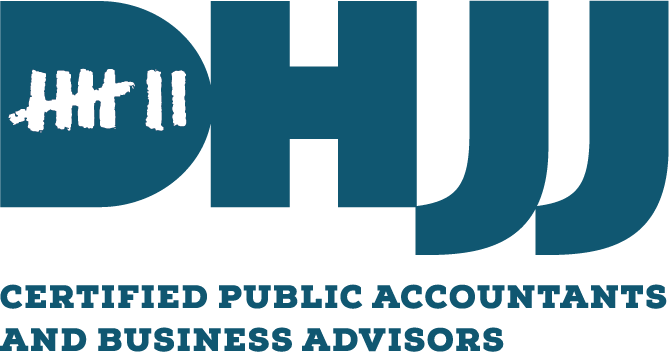 DHJJ Certified Public Accountants and Business Advisors, formerly DiGiovine, Hnilo, Jordan & Johnson, Ltd., unveiled their new brand this week symbolizing how the firm focuses on its clients, while celebrating the internal culture it built over the past 40 years. The new logo simplifies the firm’s name to DHJJ, takes the 7 recognizable hash marks from the previous logo and places them within the letter “D” of the new design. The 7 hash marks represent DHJJ’s 7 beliefs – Service, Family, Faith, Fun, Excellence, Respect, and Success. The new brand also includes a redesigned website that focuses on providing easy access to content and resources for business owners, CFOs and individuals. The updated site works easily with mobile devices so clients can quickly find the information they need, whether searching for services or connecting with the firm’s team of advisors. DHJJ exists to help clients reach their goals by making astute and well informed financial and management decisions. The firm was formed in 1974, and in the years since has grown to include over 75 team members who share a commitment to helping all clients fulfill their financial potential. With offices in the original location of Naperville, Illinois and in St. Charles, Illinois, DHJJ offers a complete range of tax, assurance, accounting, business advisory, and financial advisory services to businesses and individuals in the Chicago area and across the Midwest. For information, visit http://www.dhjj.com.